After working as a Graphic Designer Mala complete a 4 year course at the College of Phytotherapy, graduating in 2001 with a degree in Herbal Medicine. For the past 15 years she has combined her practise as a Herbalist with teaching. Her roles have included being head of Clinical Training for undergraduate and postgraduate Herbalists at the University of East London, and heading Anatomy training at the London College of Traditional Acupuncture. 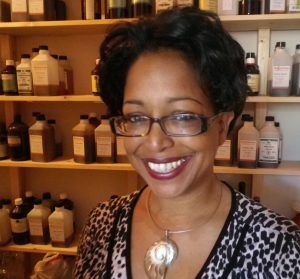 She runs workshops for Southwark Carers focusing on health and nutrition and held a weekly herbal group teaching people to make their own health and skincare products. Other interests include dog-training, art and refurbishing an old campervan. Herbal medicine is a safe and effective way to treat many chronic and acute health problems including depression, anxiety, reproductive health, respiratory and digestive disorders.